Designed as an object of curiosity and wonder, James Cox's clock has had a long history of public display. From 1768 to 1774 it was exhibited in Cox's own museum of automata in Charing Cross, London. The museum was dispersed by lottery in 1775, and by 1796 the clock was on display in Thomas Week's Royal Mechanical Museum in Titchbourne Street, London. It remained there until 1837. 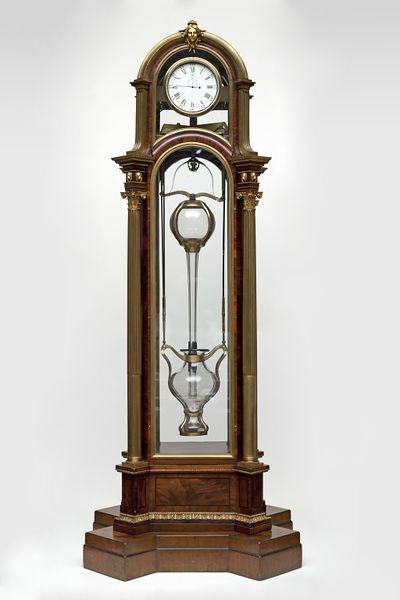 The clock's mechanism used the difference in atmospheric pressure between two jars of mercury to achieve a perpetual motion. This required at least one hundred and fifty pounds (about 68 kg) of mercury. The clock is generally recognised as the first successful attempt to produce a perpetual motion clock in England. After seeing it in Cox's museum, the astronomer James Ferguson described it as "the most ingenious piece of mechanism I ever saw in my life". Provenance: exhibited at Cox's Mechanical Museum 1773-1775; item 47 in the catalogue of Cox`s lottery, drawn 1775; exhibited Weeks’ Mechanical Museum, c.1806; exhibited Clerkenwell Institute 1898, then the property of WFB Massey-Mainwaring; purchased RG Carruthers 1921; on extended loan (without movement) to the Laing Art Gallery, Newcastle-upon-Tyne, 1958; Messrs Blairman; purchased by the Victoria & Albert Museum, 1961. The ﬁrst record of this clock which Cox called `The Perpetual Motion' is its inclusion in an edition of the catalogue of Cox's Mechanical Museum dated 1773 (Guildhall Library, Pam 6546, no. 47). In January 1774 it was inspected, possibly at Cox's invitation, by the fashionable lecturer in natural philosophy, James Ferguson, who wrote of it: ‘... indeed, on examining the whole contrivance and construction, I must with truth say that it is the most ingenious piece of mechanism ever saw in my life.’ A description of the clock appears in the Annual Register, vol. 17, p248, also for 1774. The clock does not appear in two earlier catalogues of Cox's Mechanical Museum (1772 and 1773). The evidence points to the clock having been completed in 1773. Its construction must have taken a considerable time so one can state with conﬁdence that the clock was wholly or largely made while Merlin was still Cox`s ‘principal mechanic’. Thus Merlin probably played a large part in its design and construction and this must have been one of the last projects on which he was employed while he was in Cox's service. One must notice, however, the claim advanced on behalf of Samuel Rehe, who was possibly a rival of Merlin. Writing in 1799, apparently from memory twenty-ﬁve years old, William Nicholson stated of the barometric system: ‘… but this was afterwards explained to me by Mr. Rehe, who contrived and made it.' (William Nicholson, Journal, vol. III, 1799, pp126, 127.) Rehe is noted by Nicholas Goodison (English Barometers, 1969), as a maker of barometers, working in Shoe Lane. He was therefore a neighbour of Cox and it is quite possible that Cox, or Merlin, turned to him for the glassware for the barometer. It seems signiﬁcant that the description, said to have been supplied by Rehe, is somewhat approximate. The clock is contained in a standing case of mahogany with ormolu mounts, glazed on all sides. The base is formed as a rectangular plinth with projecting corners on which are raised freestanding Corinthian columns of brass (presumed originally to have been gilded). Between these the case is formed with arch-headed glass plates revealing the mercury barometer (now empty) that gives motion to the clock. From the capitals of the columns rises a further arched stage, also glazed, with corners in the form of ﬂuted pilasters of brass. On the heads of the arches at front and rear are set female masks in ormolu, The arched hood uniting these is surmounted by a pedestal bearing a vase in ormolu. The white enamel dial, 9 inches (228 mm) in diameter bears Roman chapters and every ﬁfth minute is numbered with Arabic numerals, Above the centre is a subsidiary dial 2 inches (51 mm) in diameter for seconds, and above this a dial 7/8 inch (22mm) in diameter for regulation. Light balanced hands for the hours and seconds and an unbalanced hand for regulation, all in steel, are present. The minute hand is lost. Behind the dial is the movement, similar in dimensions to that of a large watch, with dead-beat escapement and a bar-balance beating 30 to the minute. This is driven by a weight hung on an endless loop of chain. The fall available to this weight is said to be sufﬁcient to allow the clock to run for three months. The most original feature of the clock is the arrangement for re-winding this weight by obtaining energy from the barometer in the lower part of the case, which is quite sufﬁcient to keep the clock going continuously. The barometer tube and bowl are suspended from opposite ends of rocking levers. They are so shaped that a small change in barometric pressure results in the transfer of a considerable mass of mercury from one to the other, altering the balance of the system. This causes the levers to rock slightly, and the barometer tube to rise and fall. Connected to the stirrup which the tube is hung is an upright rod which also moves up and down. At its upper end is a Ioop which embraces a wheel cut with ﬁne ratchet teeth. The loop has on its inner face similar teeth, up one side and down the other. The rod is connected to the loop by levers in such a way that when the rod rises the loop is urged to one side and when it falls the loop is urged to the other side. In this way the wheel continues to be turned in one direction whether the rod is rising or falling. A pawl prevents the wheel from running back as the loop moves across. The wheel is fixed on an arbour which also carries a chain wheel to raise one side of the loop of chain. The other side of the loop of chain passes over a chain wheel connected to the movement of the clock. The loop of chain hangs down on either side of the case. On one side is hung the driving weight and on the other is hung a dummy weight which serves to keep the chain extended. On one of the brass straps holding the barometer bowl is engraved: 'Week’s RI, Museum/London 1806’. Changes to case and movement have been noted which may have been made at this time. An early engraving of the clock (cat B2) shows the case without the lion's head paterae now seen below the hood; there is evidence that these paterae replace earlier ones. When acquired by the Victoria and Albert Museum the case was surmounted by an eagle in ormolu; the present case was made to correspond to that shown in the early engraving. The description of the mechanism to be found in the Commonplace Book of James Ferguson (manuscript, 1773, Col. Lib. Edinburgh) makes it clear that originally the movement was driven through a remontoir which was re-wound every twelve hours by the driving weight described above; this has been removed in favour of a direct connection from the chainwheel to the movement. Notwithstanding Cox's high-ﬂown advertisement of this clock, it does represent a significant horological achievement. lt is also a remarkable fusion of the rococo and the neoclassical in style, its handsome restraint standing in marked contrast to the ebullience of other known pieces by Cox. lt would appear that Benham's report (Scientific American, no. 1751, vol. 68, (1909), p212), that the clock was in China in 1804 was in error, although the precise whereabouts of the clock at that time are unknown. 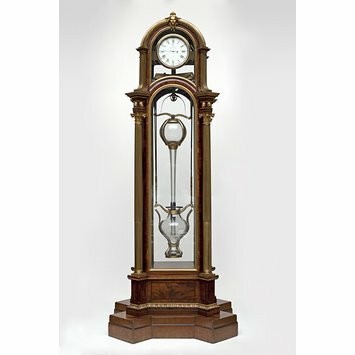 It is not impossible, but unlikely, that two similar clocks existed; examples of ‘pairs’ of Cox automaton clocks are known. The clock continued to excite some interest in the technical press even when it was not exhibited to the public. It is described in part by William Nicholson in his journal of 1799 (see above; also pt. VI) although he had apparently not seen the clock since its exhibition in Cox's Museum. It is also alluded to in the Mechanic’s Magazine, vol. Vlll (1828) pp398-9; illustrated from an old print in vol. X (1 82849) p273; and illustrated and described in some detail, again apparently from printed sources in vol. XI (1829), pp85-88. In some editions of the catalogue of Merlin's Mechanical Museum we ﬁnd reference to two clocks which share something of the spirit of Cox's Perpetual Motion. One, described as ‘A new invented perpetual Motion, representing a curious Clock’, appears to have been a puzzle clock, smacking somewhat of charlatanry. The other, ‘A New Invented Regulator ... winds itself up by the Opening of the Door …’ seems to have been rather less subtle than Cox's clock, at least in the way it was wound. In the 18th century, with the widespread interest in science, furniture sometimes incorporated elaborate mechanisms. This clock was made as a scientific curiosity. Exhibited from 1768-1774 in John Cox’s popular Mechanical Museum at Charing Cross, it was widely advertised as the only working example of ‘perpetual motion’. The clock’s movement does not need winding, as it is powered by a large barometer-like mechanism in the case.